Way too long since my last post, and way too long to upload this picture! This painting was inspired by midsummer; tall grasses, butterflies, and blooming Queen Anne’s Lace. I named it “Peek A Boo” due to the black Percheron filly peeking through the tall grasses. This filly is Ivy, one of the horses at my barn. I took the reference photo of her for this painting when she was two years old and a very tall, very heavy toddler. Sitting on the ground under a tree, the curious young horse came to investigate, sniffing my shoes, providing the perfect opportunity to snap some shots! Hi everyone! One thing I never get tired of saying is how important regular practice and constantly challenging yourself is to improving your drawing. But what do you do if you can’t seem to find nice, long stretches of time to sit at your desk, listen to music, and practice your drawing? I’ve been having this hurdle with finding the time to improve my artistic ability ever since I started at my full time job. One thing I’ve started doing is working on small practice sketches throughout the work day. It goes like this: at the start of a shift where I anticipate having a lot of down time, I take a small scrap of paper (no bigger than 4″ x 6″) and pick a photo. I’ll usually go with something interesting or challenging from Google Images. I’ll keep that window up on my computer to work from whenever I get downtime on the job. Typically, I can finish one whole picture, from blocking in the basic shapes to refining the details over the course of an eight hour workday. I can hear you now: “isn’t it irresponsible to be drawing when you’re supposed to be working?” I don’t think so, for a couple of reasons. First, most jobs do not require your constant, undivided attention throughout the day. While this is not the case for delivery drivers, assembly line workers, nurses, and other jobs that are task oriented, most of us, especially in office jobs, have down time at the desk, which usually gets turned into web surfing and solitaire. Which actually brings me to my second point. Drawing at work increases your productivity. Contrary to what you (and ALL my teachers in school) might have been led to believe, drawing or doodling does not distract you from paying attention. The opposite is true. Drawing helps improve your concentration, keeping you from getting too noted by giving you something in the present to focus on. It actually turns out eyes on the paper may be better for information retention than eyes on the speaker. As I mentioned before, many people turn to games or web surfing when they’re bored at work. When I draw at work, I am right at my work station, with my reference pic on my screen and my work program running at the same time. If the phone rings or a client walks up, I am right there to help, and I get to practice the skill I love in the meantime. Lastly, drawing while I work improves my mood. Picture how you feel when you have to go to work: tired, grumpy, maybe resentful at that huge block of time when you can’t do what you want. Maybe just reading that sentence gets the cortisol churning through your bloodstream. Now think about how you feel when you’re making art and in the flow: rhythmically applying large areas of color or shading, the intense meditative state you feel when shuting out the rest of the world to work on a small detail. You may not be able to get as far into the zone when you’re at work instead of your studio, but what you do get will probably be a lot nicer than you usually feel at work. I notice that a day drawing at work makes me feel a lot better about coming in the next day, plus I’m more likely to draw some more that night! So go ahead and take your colored pencils to work and make something beautiful. If your boss says something, show them this article and have them take it up with me. Or just check out what I drew at work yesterday! Good evening, long time no post! Back on 8th February we ushered in the Lunar Year of the Monkey. Scrolling through pictures of flowers with Chinese New Year on the brain, I couldn’t help but notice how much bleeding-heart flowers (dicentra) look like Chinese lanterns. The vision of the little flowers glowing in the night made me think of the tiny garden people that would live under those flowers, the faeries. After setting up the flowers as the framework of the scene, I added little faerie magic fireworks and ribbon dancers to add to the festivity. Faerie Lunar New Year is available as prints and other products at Society6.com! First post of the year, and long overdue! “Butterfly Weed” is a painting I started way back last June and kept putting on the back burner. It is meant to portray those midsummer days when the milkweeds are in bloom and swarming with butterflies. “Daisy Chain” is a fanciful painting I made around March to capture the essence of spring. The background of this painting uses a very loose technique with lots of bright, fresh colors. 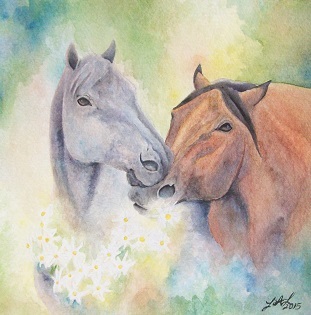 The bay horse nibbling at his buddy’s flower wreath is the inspiration for the whole scene, and provided a great opportunity to practice drawing new horse expressions! The bay horse is based on Felix, a horse at my barn who can never resist a snack! One principle in color theory is that layering basic colors close to another so that they are visually mixed by the eye leads to a richer result than mixing the colors together as a solid block of pigment; for example, lightly sketching red, blue, and yellow together to create the impression of brown rather than only using a brown pencil. Artists are encouraged to use this principle by carefully observing the color of the subject’s undertones and shadows to bring depth and life to the picture instead of just using black or white to darken or lighten a picture. The sister to this principle is the one of complementary colors: the color of the shadow will usually be opposite on the color wheel from the color of the highlight. A scene with blue shadows, for example, will have orange tones in the highlights. Usually the shadows will be dominated by a cool color, but warm shadows can lead to interesting results! 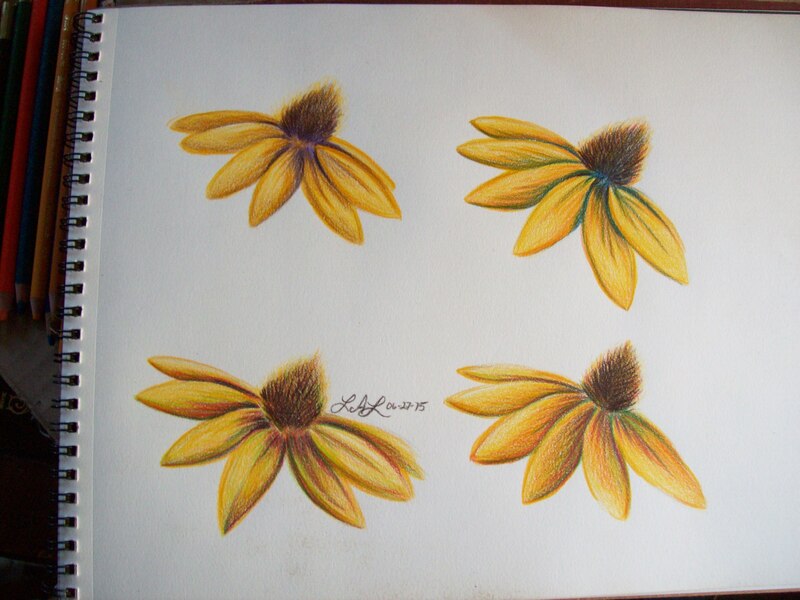 Here is a quick sketch of some black-eyed-susans. Each one uses a different color for the shadow and highlight undertones. Clockwise from left are purple and yellow, blue and orange, green and pink, and deep red with light green. Which result is your favorite? Tell me in the comments! Black Eye Susan Flower Color Study: Clockwise from left, purple, blue, green, and red.